In early December, waves of change washed ashore Cottesloe Beach, in Perth, AU, where the Australian Department of Foreign Affair’s innovationXchange convened 10 inspiring teams of innovators, with two dozen expert Council Members from across the aquaculture and development sectors to kick off the Blue Economy Challenge’s Aquacelerator. Discovered through the 2016 Blue Economy Challenge, this diverse and promising group of pioneers was selected from over 200 applications from 41 countries for their potential to revolutionise the aquaculture sector. The Aquacelerator kickoff brought the 10 winning teams together with experts to accelerate their plans to develop new ocean products, rethink aqua feed and enhance sustainable design of aquaculture operations, and ultimately accelerate and scale environmental, social and economic improvements for the Indian Ocean region. 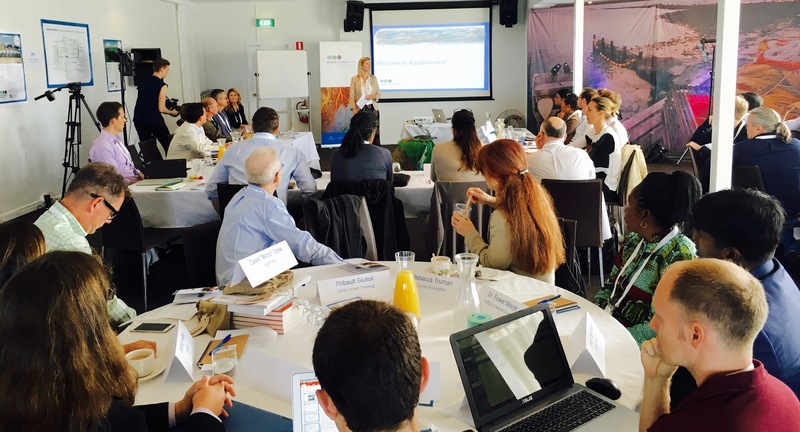 This meeting starts the Aquacelerator’s 6 month long accelerator program, which convenes resources from across the public and private sectors to supplement DFAT’s AUD3 million support to the 10 finalists. Programs like the Aquacelerator, are at the cutting edge of global development – utilising strategies to stimulate development at scale in the communities, countries and regions where Australia invests. During the meeting, the winning teams and the Council Members identified dozens of connections, business opportunities and potential investments. One of the most promising opportunities emerged between the Fellows themselves, as they explored an aquaculture incubator in Tanzania to support the nascent but quickly growing aquaculture industry. The participants dove headfirst into the connected issues – such as production supply chains, sustainable aquafeeds and smallholder farmers’ empowerment – with a diverse group of representatives of high-impact, global organizations, such as the United Nations (U.N.) Environment Programme, along with private sector representatives from Ridley and Alimentos Ventures, and development experts such as MicroSave. This network of supporters will become the innovators’ links to other global stakeholders, from shareholder shrimp farmers in India to corporate feed suppliers around the world; to social entrepreneurs, technical experts, impact investors and government leaders. Saumil Shah is the managing director and founder of EnerGaia, a Bangkok-based organisation that has discovered how to use urban rooftops and remote communities to cultivate a 3.5 billion year old cyanobacteria (traditionally, known as pond scum) into a resilient, safe and tasty “superfood”. Touching ten of the seventeen U.N. Sustainable Development Goals, EnerGaia’s solution has the potential to supplement a food sector incapable of sustaining the exponential growth of our global population. “We are going to use the funds [from the Blue Economy Challenge] as a way to micro-finance our system in rural areas,” Shah told Facebook Live viewers, during the Summit, where he treated in-person attendees to savory chocolate morsels and an protein rich linguini dish enhanced with spirulina powder. 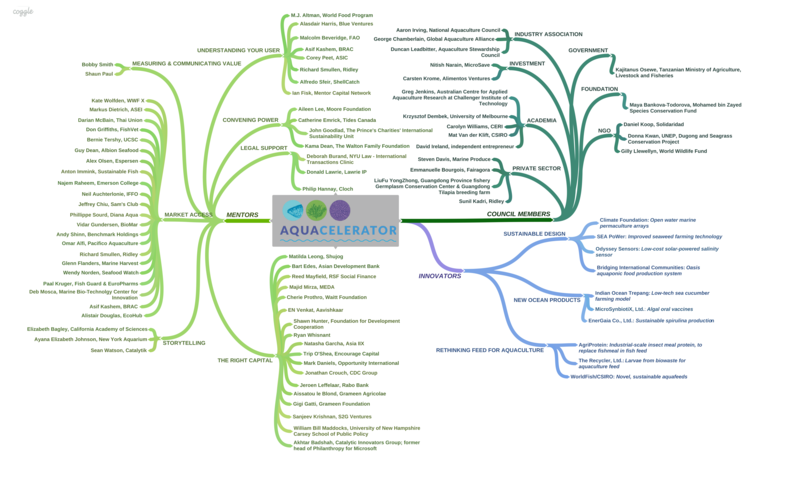 Through April of 2017, Aquacelerator network members and innovators will engage in an intensive and collaborative learning process to accelerate these innovations, to fuel a more sustainable future for our oceans. Follow the Aquacelerator network journey with #Aquacelerator on Twitter and on Facebook at facebook.com/secondmuse.